Ben Lonetree is an electrical engineer who has continuously monitored several geophysical parameters over decades. His highly sensitive custom equipment outperforms government stations. He says, "There is a reason why my system responds to many things other magnetometers do not. Most are fluxgate mags. that sample a collapsing field at a very slow sample rate. My system is simply a very large induction coil that after the amplifier and filter stages couples into an analog to digital converter. I have the converter programmed to use a sample rate of 240 times per second. So the systems sees every little blip there is out there." He has conducted numerous experiments correlating local geophysical anomalies in earth's magnetic field with EEG brainwaves of many subjects, and anecdotal reports of changes in consciousness. Preliminary experiments were done as proof of concept with intent to investigate the possibilities more deeply. "All behaviors, including consciousness, are generated by and correlated with brain activity. The activity can be conceived as complex matrices of electromagnetic patterns and their associated chemical changes. Weak intensity complex magnetic fields generated by the earth and by human technology affect consciousness and experience. The critical factor is not the intensity of the fields but their patterns and the information contained within the patterns. Those patterns that are most similar to the natural temporal configurations of brain activity are most effective." 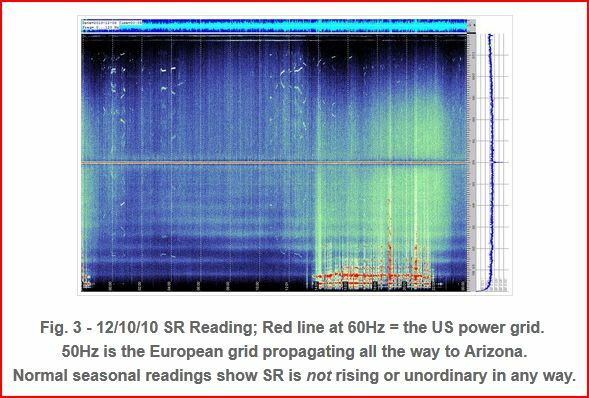 Lonetree's longitudinal EMF studies in several stages over nearly a decade have included phases of monitoring Schumann Resonance (SR), magnetic flux and weather patterns in the test regions of Arizona. He conducted repeatable experiments using a variety of volunteer subjects and weather conditions. Using magnetometers and EEG, he recorded the synchronous signals of geomagnetic anomalies with human brainwaves. Parameters include SR (amplifies effect), brainwave frequency and amplitude, and sudden magnetic events from multiple vortex spots. Evoked potentials include high well-being, healing, nature mystic experiences, ESP or anomalous cognition, and other psychophysical phenomena. J. King describes a more exotic research direction stemming from a startling discovery. Evidence of similar magnetite crystals found in the Martian meteorite ALH84001 suggest the possibility of life on Mars. This identification relied on a comparison of the morphology of the meteoritic magnetite crystals with the magnetosomes from the magnetotactic bacteria, MV-1. Naturally, Mars lost its protective magnetosphere aeons ago when its core cooled and stopped rotating. Still, analyzing geophysical fields from many factors takes skill in data interpretation of electric (geoelectric horizon), seismic, magnetic and gravitational methods. Characteristic include higher gravitational fields, mozaic positive and negative magnetic fields, and high values of apparent resistivity of rocks. Massive magnetite deposits can produce magnetic fields several times the magnitude of Earth's normal field. The presence of magnetite can give basalt measurable magnetic properties. Remnant magnetic fields are also related to gravity and tectonic structure. Precambrian crystalline rocks and igneous rocks generally contain sufficient magnetic minerals to cause variations in the earth's magnetic field. The predominant magnetic mineral in these rocks is magnetite. High density basement may or may not be equivalent to crystalline or magnetic basement. The location within the geologic column of an area where the deepest major susceptibility contrast occurs. In areas where the crystalline basement is magnetic, the magnetic basement is equivalent to crystalline basement. Shallower susceptibility contrasts (such as occur when volcanic or magnetic sediments are in contrast with non-magnetic rocks) may mask or complicate the interpretation of magnetic basement. Susceptibility variations within magnetic basement are common. In Sedona, latites extruded from volcanic plugs produce intense "circular" magnetic anomalies and magnetic lows, because they are generally reversely polarized. 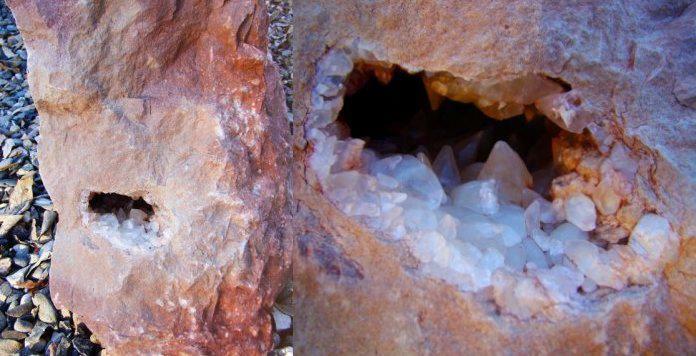 Not visibly crystalline, latites are of volcanic origin composed chiefly of sodic plagioclase and alkali feldspar with subordinate quantities of dark-colored minerals in a finely crystalline to glassy groundmass. Faults and igneous intrusions often produce small local distorting magnetic fields, according to USGS Magnetic Anomaly Survey. Complete Report: http://sedonanomalies.com/usgs_magnetic_anomaly_survey.htm Maghemite forms as nodular growths in laterites and weathers out to form ironstone gravels. Sedona is rich in paramagnetic Fe2o3, (iron oxide; hematite), the element responsible for the red rocks, soil, and even the red color of the inner bark of trees. Iron oxide has magnetic properties depending on factors including pressure. Iron(III) oxide is the inorganic compound with the formula Fe2O3. It is of one of the three main oxides of iron, the other two being iron(II) oxide(FeO), which is rare, and iron(II,III) oxide (Fe3O4), which also occurs naturally as the mineral magnetite.In addition to iron oxide, the mineral magnetite may also exist in large quantities in Sedona. Concentrations of iron oxide and other metal/minerals have the effect of focusing the earth's natural geomagnetism which is produced by the Earth's molten outer core. The range of SR frequencies are related mathematically, but are not true harmonics. Perhaps it is closer to think of SR as the “Voice of the Planet,” rather than its heartbeat, which is around the 10Hz. Cycle (Lonetree). There is a harmonic relationship between the earth and our bioelectronic mind/bodies. Earth's low frequency isoelectric field, the magnetic field of the earth, and the electrostatic field that emerges from our bodies are closely interwoven. Our internal rhythms interact with external rhythms, affecting our balance, REM patterns, health, and mental focus. In Alpha, we begin to access the wealth of creativity that lies just below our conscious awareness - it is the gateway, the entry point that leads into deeper states of consciousness. Alpha waves aid relaxation and overall mental coordination, calmness, alertness, inner awareness, mind/body integration and learning. Theta waves mean 'slow" activity often connected with creativity, intuition, daydreaming or recalling emotions and sensations. Focus is internal in this state between waking and sleep. Theta meditation increases creativity, enhances learning, reduces stress and awakens intuition and other extrasensory perception skills. Our experimental goal in Sedona isn't to teach or augment meditation, but just to monitor imposed changes on those simply relaxing at the geomagnetic sites. The multi-colored vertical bar graph on the right is the intensity of each individual brainwave and their sub-frequencies. Our brainwaves cover a wide bandwidth and can occupy several Hertz. The white horizontal line you see imposed over the vertical bar graph is raw brainwave data. The brainwave monitoring equipment uses an algorithm to create the image you see on the left. It is known as FFT (Fast Fourier Transform) and it permits us to see what brainwaves are dominant at any given time. Beneath the bar graph are two meters. One labeled Attention and the other Meditation. They chart both level of attention and level of meditation at any given time. State of mind during the "in or outflow" of magnetic activity can be monitored by looking at the "Attention/ Meditation" Indicators. We also see what brainwave "s" are dominant at that particular time. Dominant Delta occurs during sleep. Theta and Alpha during relaxation and meditation. Beta is a product of awake, alert and active. Above Beta into Gamma is wide awake and very active. The baseline chart was recorded at the beginning of each outing and shows brainwave activity while no natural magnetic activity is present. In the baseline chart, all is quiet. When magnetic activity commences, synchronization of magnetic and brainwave phenomena is demonstrated. Chart 2 correlations: Magnetic in and outflows have begun. Green tracing lines show what raw brainwave event coincides with what earth generated magnetic event. At this point Lonetree recorded both in and outflows of magnetic energy. 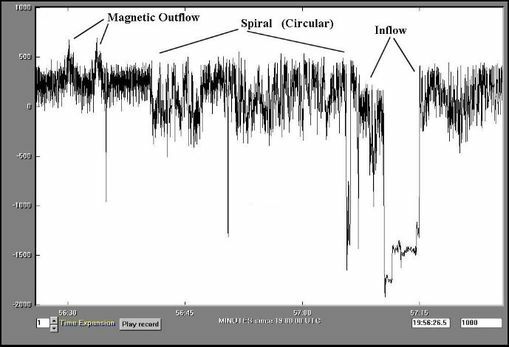 It is not displayed in the chart but the magnetic energy emits or returns into the earth in a spiral motion. Outflow is indicated by a positive (upward) reading in the graph and inflow by a (downward) reading in the graph. It is evident the "Naturally Occurring Magnetic Energy" in Sedona has a distinct effect on "Human Brainwave Activity". More tests are needed with a number of volunteers to replicate and verify these findings. The final chart reflects magnetic activity subsiding and brainwave activity returning to normal. Kirschvink, J., et. al. "Magnetite Biomineralization In the Human Brain." Proc. Natl. Acad. Sci., Vol. 89, pp 7683-7687, Aug 1992. Kirschvink, J. "Can Weak ELF Magnetic Fields Produce Significant Effects onBiogenic Magnetite?" Project Abstracts, pg. 79, The Annual DOE/EPRI Review On Bioeffects of Electric & Magnetic Fields. Palm Springs CA, Nov 1995. Joseph L. Kirschvink, Atsuko Kobayashi-Kirschvink, Juan C. Diaz-Ricci, and Steven J. Kirschvink, "Magnetite in Human Tissues: A Mechanism for the Biological Effects of Weak ELF Magnetic Fields",http://web.gps.caltech.edu/~jkirschvink/pdfs/KirschvinkBEMS92.pdf "...at least one terrestrial animal (bees) is capable of detecting earth-strength magnetic fields through a sensory process. In turn, the existence of this ability implies the presence of specialized receptors which interact at the cellularlevel with weak magnetic fields in a fashion exceeding thermal noise. A simple calculation shows that magnetosomes moving in response to earth-strength ELF fields are capable of opening trans-membrane ion channels, in a fashion sitnilar to those predicted by ionic resonance models. Hence, the presence of trace levels of biogenic magnetite in virtually all human tissues examined suggests that similar biophysical processes may explain a variety of weak field ELF bioeffects." Ionic resonance - Hence, at frequencies below about 10 Hz there should be minimal effects of alternating fields of virtually any strength, as the ion channels and membranes have enough time to respond. Due to the apparent lack of a biophysical mechanism, the question of whether weak, low-frequency magnetic fields are able to influence living organisms has long been one of the most controversial subjects in any field of science. However, two developments during the past decade have changed this perception dramatically, the first being the discovery that many organisms, including humans, biochemically precipitate the ferrimagnetic mineral magnetite (Fe3O4). 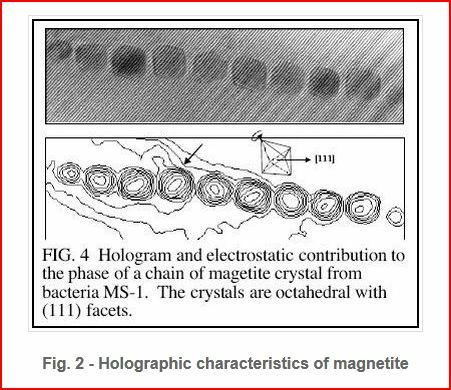 In the magnetotactic bacteria, the geomagnetic response is based on either biogenic magnetite or greigite (Fe3S4), and reasonably good evidence exists that this is also the case in higher animalshoney bee. Second, the development of simple behavioral conditioning experiments for training honey bees to discriminate magnetic fields demonstrates conclusively that at least one terrestrial animal is capable of detecting earth-strength magnetic fields through a sensory process. In turn, the existence of this ability implies the presence of specialized receptors which interact at the cellular level with weak magnetic fields in a fashion exceeding thermal noise. A simple calculation shows that magnetosomes moving in response to earth-strength ELF fields are capable of opening trans-membrane ion channels, in a fashion similar to those predicted by ionic resonance models. Hence, the presence of trace levels of biogenic magnetite in virtually all human tissues examined suggests that similar biophysical processes may explain a variety of weak field ELF bioeffects. Milsom, John, Field geophysics, Volume 12, Issue 180, Persinger, Michael A. (1987). Neuropsychological Bases of God Beliefs. New York: Praeger. Persinger, M. A., & Valliant, P. M. (1985). "Temporal lobe signs and reports of subjective paranormal experiences in a normal population: A replication". Perceptual and Motor Skills, 60, 903-909. Ryan, Adrian, "New Insights into the Links between ESP and Geomagnetic Activity"
Simon, Baconnier, Lang Sidney B., De Seze Rene, "New Crystal in the Pineal Gland: Characterization and Potential Role in Electromechano-Transduction", http://fedgeno.com/documents/crystal-in-the-pineal-gland.pdf "The pineal gland is a neuroendocrine transducer secreting melatonin, responsible for the physiological circadian rhythm control. A new form of biomineralization has been studied in the human pineal gland. It consists of small crystals that are less than 20 μm in length. These crystals could be responsible for an electromechanical biological transduction mechanism in the pineal gland due to their structure and piezoelectric properties."